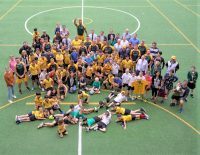 On Tuesday 2 April, AISHK was thrilled to open its doors to the Classic Wallabies who bounded onto AISHK field ahead of Rugby Sevens week! 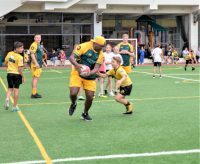 Rugby greats including Wendell Sailor, James Holbeck, Justin Harrison and Stephen Larkham along with a host of younger Sevens players who will be playing with Classic Wallabies in the GFI 10s descended on the school field to the excitement of many students and parents. A training clinic featuring a rotation of rugby challenges was held especially for AISHK and USRC Tigers students. This was followed by a Q&A session, autographs and some spectacular photo opportunities. Parents, staff and students were welcome to attend as spectators for this special event. AISHK extends a very warm thank you to all players and team member for taking time out of their busy schedules to visit AISHK! 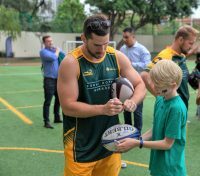 Special thanks must also go to The Kerry Hotel, host to the Classic Wallabies again this year, who brought this opportunity to our community.